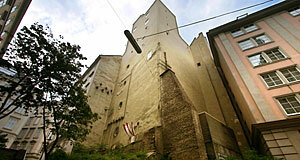 It was built between 1825 and 1827 - thus my claim that it is Vienna′s oldest skyscraper. Of course it is far from being a real one, but it does look surprisingly modern for a building of the Biedermeier age. The Biedermeier period followed the Napoleonic Wars and the Vienna Congress and was an age of domestic tranquillity and simple family life. The re-established Habsburg monarchs kept a watchful eye on the rising urban middle-class and all democratic ideas were strictly persecuted. Houses were often humble on the outside compare to their Rococo and neo-Classical predecessors. The Kornhäuselturm is a particularly plain building: The walls are somewhat naked and there are few windows. According to legend, Kornhäusel wanted to build himself a sanctuary to escape from his nagging and terribly jealous wife. In fact, the architect preferred to work on the top floor of the tower and always closed the draw-bridge that connected the tower with the neighbouring building. Between 1842 and the year of the revolution 1848, the writer and painter Adalbert Stifter lived in the Kornhäuselturm. In his first year there, he observed a total eclipse of the sun. This event left quite an impression on the writer, and he described it in detail in his book "Aus dem Alten Wien" ("From the Old Vienna"): "Colours that no eye has seen before roamed the sky. I was awed in satisfaction and so moved, as if God had spoken a clear word and I had understood." („Farben, die nie ein Auge gesehen, schweiften durch den Himmel. Ich war von Schauer und Erhabenheit so erschüttert, es war als hätte Gott ein deutliches Wort gesprochen und ich hätte es verstanden."). Today, the Kornhäuselturm Tower serves as a residential building and despite of its rather bleak appearance, it is said to be very fancy and modern inside. It hosts a restaurant, which opens at least a part of the tower to the public. Attractions nearby include - well, the first district is packed with attractions. To name only the closest ones (those within a three minute walk): The Stadttempel or Main Synagogue of Vienna, the Romanesque Ruprechtskirche, the Am Hof Square and the Vermählungsbrunnen Wedding Fountain; the Bohemian Chancellery, the Museum am Judenplatz; the Altes Rathaus and Maria am Gestade; and the Stephansdom Cathedral.